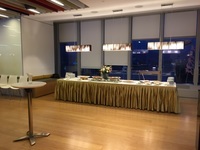 Wilfred Catering is a popular catering company in Hongkong that has been catering since 1990. Wilfred Catering has served several government and multinational companies. With its delectable menu, it has captured the hearts of its clients. 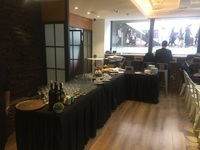 Wilfred Catering Catering uses high quality and fresh ingredients for their dishes and is also one of the top caterers in HongKong. 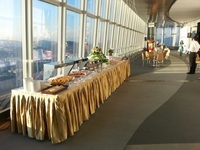 Wilfred Catering offers and they aim to build a good relationship with their clients. Wilfred Catering Catering believes that mouth-watering food should be the highlight of any occasion. They also place a strong emphasis on food hygiene, especially during food preparation. Wilfred Catering's catering menu features bento boxes and sharing platters perfect for your office lunches, client meetings seminars, and any events. Wilfred Catering may also cater to some Junk Party need you may be looking for. They're sure to be a favorite at your next event or party, so make sure to treat your guests to Wilfred Catering catering. 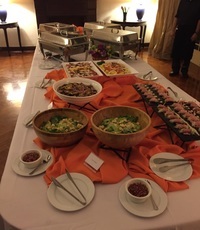 Wilfred Catering Catering also offers various meal options for their clients based on their budget, volume and delivery time. 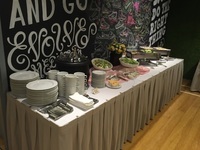 Some popular dishes on the Wilfred Catering catering menu includes their Roasted Sirloin of Beef, Tea Party Mini Buffet 2, and Asian Mini Buffet 2. A favorite meat platter in the menu is the Roasted Sirloin of Beef while their Tea Party Mini Buffet 2 is a wonderful high tea menu that includes 6 food items and 3 beverages with items such as Smoked Salmon Wedge on Bread, Mini Strawberry Mousse Cake, and sandwiches. Another popular menu on is the Asian Mini Buffet 2 is a wonderful 13 course mini buffet featuring delicious Asian cuisine dishes with items such as baby octopus, Korean beef rib, and fried rice. With our experienced chefs and passionate team, you will definitely be satisfied with our menu and services." Looking to get Wilfred Catering delivered to you? Wilfred Catering delivery is available for Hong Kong Island, Kowloon, New Territories. Make sure to check their schedule for delivery times, which is usually Mon - Sat 9:00am - 7:00pm and do note that their menu requires 3 days' notice for placing orders, so don't be disappointed! Thanks to Caterspot, you can have Wilfred Catering to cater to your needs and preference. You can simply place your order via our website. Alternatively, you can also call our hotline. Our friendly staff will be pleased to assist you in your booking or any inquiry. WIth Caterspot, we provide a seamless experience and convenience to our clients: once you have placed your order, you can count on us to deliver mouth-watering , fresh Wilfred Catering catering menus to your location.